Sometimes web apps are better than native apps because they can be constantly updated and users always have the latest version. Google still hasn't released a native Google Maps app for iOS, but it has improved the mobile web app by adding support for street view. 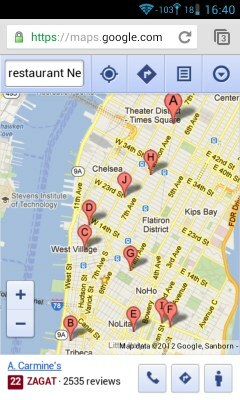 Now the Google Maps web app has all the features from Apple's old maps, even if the performance is inferior. "With access to Street View on your phone, you can use panoramic, street-level imagery to explore and navigate the places around you, even on the go," informs Google. 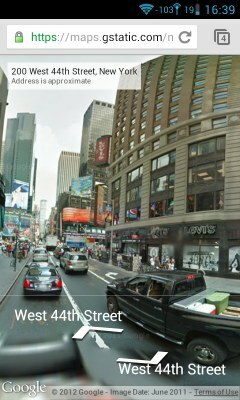 Obviously, Street View for mobile browsers uses SVG and HTML5, not Flash. If you've updated an iPhone, iPod Touch or iPad to iOS 6, open maps.google.com in Safari, tap the arrow icon and then "add to home screen". Now you can open Google Maps from the home screen, search for local business, get directions, switch to the satellite view or open your personalized maps. Google has constantly improved the maps service in the past 7 years, so Apple has a lot to catch up. The Google Maps web app is not new, but it will be used a lot more, now that Google Maps links no longer send users to the built-in maps app and open in the browser. Google, will you ever realise the Google Navigation for iOS? Is it in a corporation's plan? I don't know what Google intends to do. If I were to guess, I'd say that the Google Maps app should have most of the features from the Android app, including navigation. I really appreciate your post, thank you for sharing. I strongly recommend Google Maps rather than Apple Maps because it doesn't have public transportation directions feature.